Meet Kendrik! 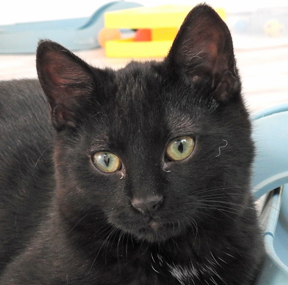 Kendrick has become an affectionate kitten who enjoys pets, chin rubs and lying on his foster mom's lap but he is still fearful of strange noises and people he does not know. He prefers to approach people who are already sitting down and will purr and roll about in enjoyment. He is quite fond of treats! He plays gently with his brothers and snuggles up to them when tired. His favorite toy is the ball track and will come zipping down from the cat tower to watch the ball go round. He thinks the best thing in life is watching the ball spin while receiving pets! Kendrik would do best in a home with older or teen children and would love to have a cat companion. Make this brave boy a part of your family today!